Astronomers have detected two new so-called "warm Jupiter" exoplanets orbiting stars located more than 1,300 light years away from the Earth. The newly found alien worlds are similar in size to Jupiter but much hotter than our solar system's gas giant. The findings were presented Aug. 23 in a paper published on arXiv.org. The new exoworlds, designated EPIC 211418729b and EPIC 211442297b, were initially identified as transiting planet candidates in mid-2015 by NASA's Kepler spacecraft prolonged mission known as K2. 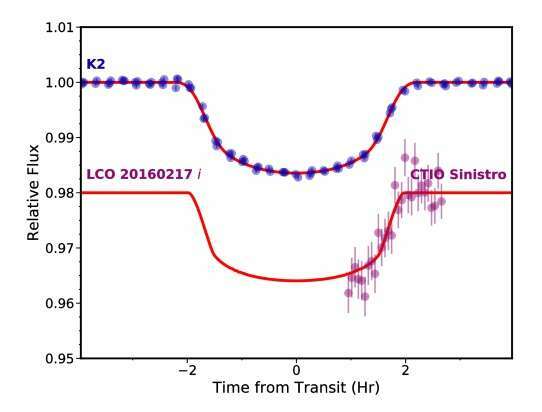 Now, a team of astronomers led by Avi Shporer of the California Institute of Technology (Caltech) presents the results of follow-up observations, which confirmed that both K2 candidates are indeed transiting exoplanets. Shporer's team conducted the observations between January 2016 and May 2017. They performed high angular resolution imaging of the parent stars EPIC 211418729 and EPIC 211442297 using the Keck II telescope of the W.M. Keck Observatory in Hawaii and the Gemini North telescope, also in Hawaii. The researchers also obtained high resolution spectra and carried out radial velocity monitoring of the stars with the HIRES instrument on the Keck I telescope. Moreover, these observations were complemented by photometric data from three ground-based telescopes located in Arizona, Chile and South Africa. The observational campaign resulted in confirming the planetary nature of transit signals acquired by K2 and allowed the scientists to derive fundamental parameters of the two systems. "We have discovered two transiting warm Jupiter exoplanets initially identified as transiting candidates in K2 photometry," the team wrote in the paper. According to the study, both newly detected extrasolar worlds are about the size of Jupiter and orbit distant, relatively old stars. However, they vary in mass and are much hotter than our solar system's biggest planet. EPIC 211418729b has a radius of 0.94 Jupiter radii and is nearly two times more massive than Jupiter (1.85 Jupiter masses). The planet has an orbital period of 11.4 days and an equilibrium temperature of 719 K. The planetary system is located about 1,570 light years away from the Earth. EPIC 211442297b is much less massive than EPIC 211418729b – it has a mass of about 0.84 Jupiter masses. However, the planet's radius is approximately 11 percent larger than that of Jupiter. Located some 1,360 light years away from the Earth, this exoplanet has an equilibrium temperature of 682 K and orbits its parent star every 20.3 days. The researchers noted that both planets are among the longest period transiting gas giant planets with a measured mass. They also found that the newly discovered exoworlds are not inflated as their radii are typical for such giant planets, consistent with theoretical expectations. The scientists revealed that EPIC 211418729b and EPIC 211442297b will be targets of future K2 observations during the mission's campaign 18, which will last from May to August 2018. This additional monitoring could uncover more details about these two planetary systems. "If successful, this will give a three-year time span and therefore allow refining the transit ephemerides and the planet-to-star radii ratio, looking for transit timing variations and searching for other transiting planets in those systems," the paper reads.